I was determined that after the last few days of full-on driving, today would be an easy one. The plan was to cover the final 100km to Norseman (we only fell short of completing the distance because of fading light, and you know why that's a bad thing out here!) and find a a motel room or caravan cabin. Basically, something that would give us some room to stretch out for the day, a TV to veg out in front of and generally be lazy in. It had been a long time since we had treated ourselves to a proper room anywhere and I was looking forward to it. Arriving in Norseman, we both got the impression that it looked quite a shabby kind of place. We certainly weren't expecting pavements lined with gold (although, ironically, having a gold mining history perhaps there might be some traces there? ), but it wasn't immediately obvious where would be a good place to stay for the day. Oh heck, I thought, let's go to Esperance. In doing so, I added a further 207km to my non-driving day, bringing the total over 315kms! 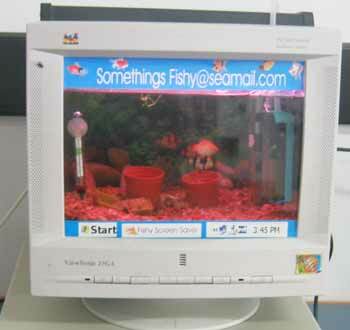 A fish tank made to look like a screen saver (trust me, there were real fish in there!). I got back to the caravan and, once again, immediately headed back out with a food order - we were doubly treating ourselves - a proper place to stay and a takeaway pizza. It beats warming up tinned food on a portable stove in the Kombi for a change. The rest of the evening was spent in front of the tiny TV, laughing at the often dire early auditionees for Australian Idol while supping some VBs (that's Victoria Bitter, for those thinking, perhaps, that it's a programming language or a disease of some kind). See, I told you we planned on blobbing out!